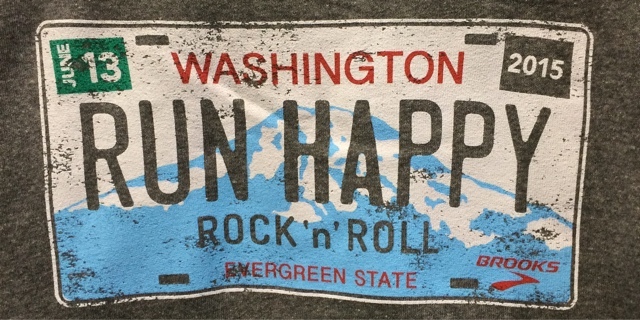 Still feeling happy … and a little sore … from running the Rock 'n' Roll Half Marathon on Saturday. It was a perfect Seattle summer day: skies were Perry Como blue, nice and cool in the morning, and I never got too hot… not like earlier in the week! 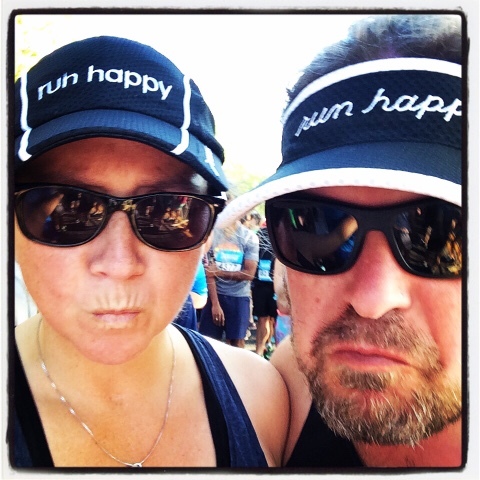 personalized bibs -- I noticed that Ryan's said "Run Happy! ", which I thought was because he hadn't personalized it, but he said, "I wasn't creative enough to put my name on it…"
Worked the expo for a few hours on Thursday -- pretty quiet after the initial lunchtime flurry, but the short shift (4 hours), fun job (prize booth! ), and good teammates (Emiko and Summer) made the time pass quickly. I'm still so impressed by the graphics for this race -- super cute. How cute? So cute that -- after running THIRTEEN RnR races, I bought my FIRST piece of official race merch. To be fair, much of that is because the last thing I need is more running gear, and I rarely buy apparel at other races. I haven't even bought any clothes at a runDisney race since 2010. 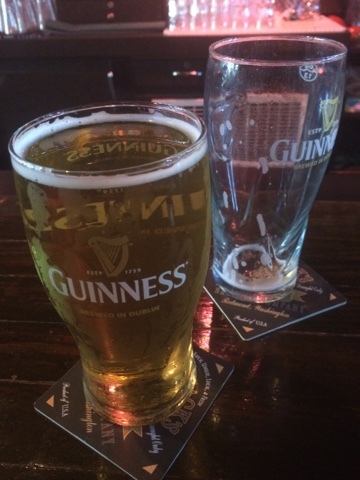 I'm more of a pint glass / souvenir pin sort of gal. I bought the tank on the bottom right -- AND wore it during the race! 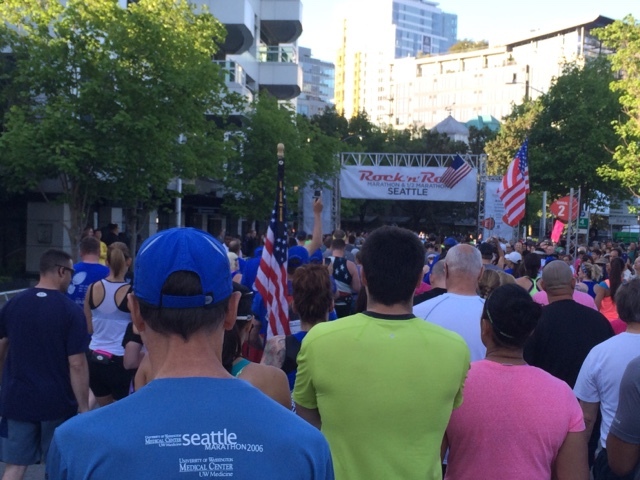 Saturday morning was lovely and cool -- I wore a "disposable" t-shirt over my clothes -- and we rode the D-Line to the Seattle Center with a bunch of runners. How bewildering for the "ruggles" to see so many ponytailed runners piling on to the bus at 5:49 a.m. The Seattle Center grounds looked great -- lots of nice, big activations from the sponsors. We followed the crowd and headed into the Armory, where we roamed around a little before finding a quiet corner to perch in. Eventually we made our way to the Brooks VIP Porta Potty line, where we ran into our Brooks pals Ryan, David, Jenn, and Tara. Wil -- being foreign -- is always a little bemused? befuddled? annoyed? by the line sorting at the potty. Being asked "number 1 or number 2" when getting in the men's line always stops him briefly. We headed out to the corrals -- SO MANY CORRALS -- and found our spot. We were with the Wear Blue, Run to Remember group -- reading the names and seeing the pictures of the fallen soldiers always makes me weepy. When our corral made it to the start line, there was a brief pause while the names of the men and women being honored were read. Amusing -- we had been sent an email the day before the race telling us about a "Race Day Surprise!" 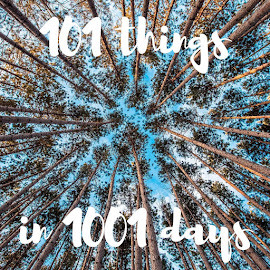 and to "Get Excited, And Don't Be Startled At The Start Tomorrow!" Why? 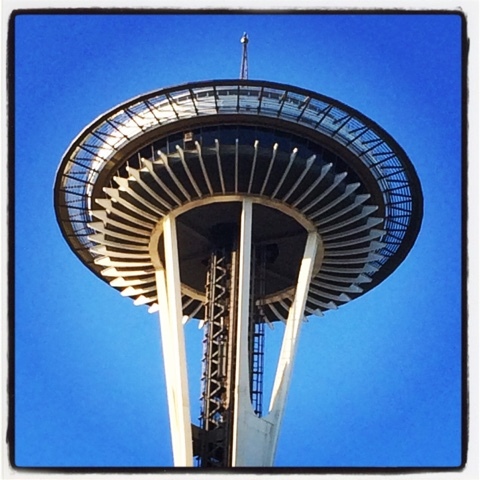 Because the Space Needle -- "for the first time ever"! -- would be "transformed into the world's largest starter's pistol" and a round of "thunderous comets" would be fired from the 200' level. Maybe people get spooked by fireworks… I don't know. Or maybe I'm accustomed to fireworks to send off at least the initial corral. But, anyway, they warned us multiple times through the morning, which was pretty funny. The wheelers set off at 6:55 -- I just keep thinking how AWFUL some of this course would be in a wheelchair! Then a rock guitar version, a la Hendrix, of the Star-Spangled Banner (nice!) -- and then, after ANOTHER WARNING NOT TO BE ALARMED, the "comets" went off and the first corral was set loose. the bluest skies you've ever seen, etc., etc. I really enjoyed the corral time -- it was a gorgeous day, with the Space Needle dazzling white against the blue blue sky… just kept smiling and wanting to shout "THIS IS MY CITY!!! WELCOME TO MY CITY!!!" I did miss having my friend John Bingham on hand to kick things off; though the announcers, a man and a woman, were okay. The man even said, "Nice to see you, to see you nice", though it was lost on 99.9997% of the crowd. Brucie never really entered our consciousness over here. Then we were off -- lots of elbow room due to the small corrals, which I love. I couldn't quite remember how we would be getting to the stadiums, so was a little surprised to be zigzagging onto 5th, but it's nice to run under the monorail, even if I didn't see any trains whooshing overhead. Up up up to the crest of 5th, then down down down to the ID, left and over to MLK, and then eventually out to the lakes. 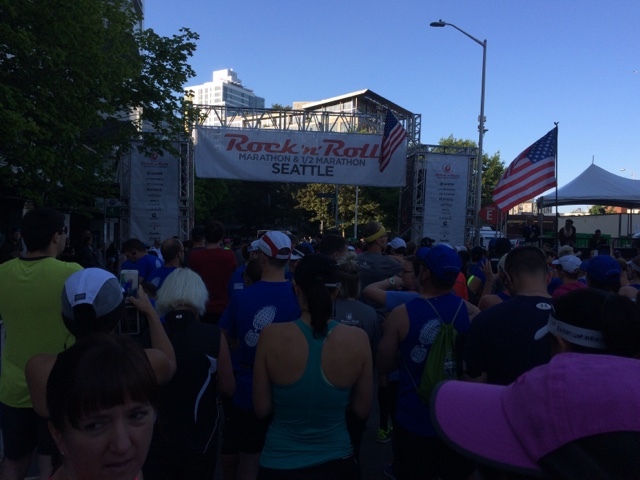 Somewhere along this stretch we ran past the Seafair water stop, staffed by CLOWNS and PIRATES and PRINCESSES and Sarah from runclub, which gave me a boost of energy. Also nice to see the Dude … well, both of my favorite running dudes! 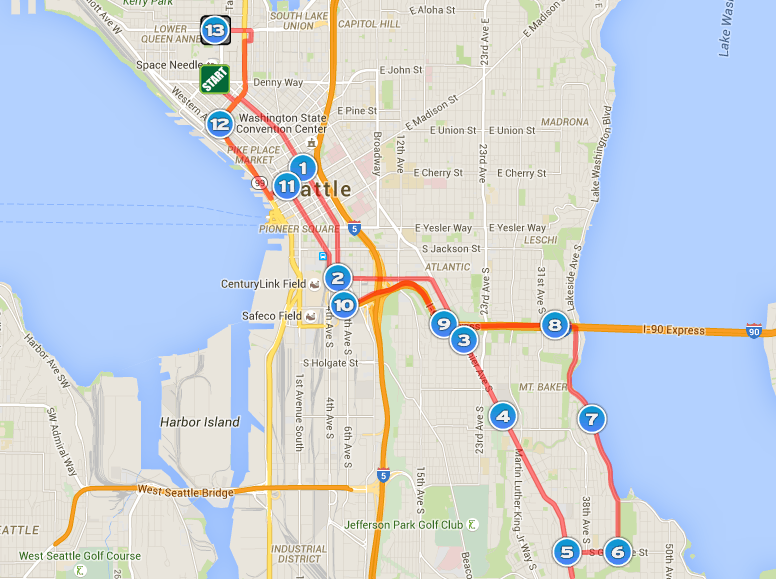 The stretch along Lake Washington -- right after the half/full split and re-merge -- is super beautiful… especially since it's the "Wear Blue, Run to Remember" mile. Lots of people proudly standing with American flags and photographs of fallen soldiers, most of whom were shouting words of encouragement. Then came the second worst part of the course: that silly steep hill up to I-90. I cannot imagine how difficult that would be for the wheelchair athletes to race up. It's bad enough on foot! The I-90 tunnel is so hard for me. Something about the muggy, airless interior, the tilted roadways, always makes me feel woozy. Having a DJ with strobe lights didn't help! So I dropped to a walk - there was nothing else to be done. Toward the far end of the tunnel there was a person down, surrounded by medics and others, stretchers, and lots of gear. I try not to look more than a glance to make sure the person is being attended to, since it's someone's private hell and I don't want to intrude. It didn't look good, but I tried to send good vibes (as much as I had any…) as we ran by on the far side of the lane. 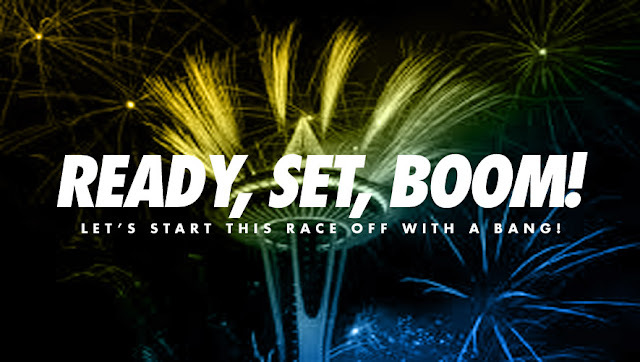 I had reminded my pal Kerstin of my "RNRSEA Pro-Tip" before the race: hydrate up before you leave the tunnel! I don't know what it is, but I always struggle on the ramps to downtown (miles 9ish - 11ish). The sun, the ramps, the "so near and yet so far" feeling… and the lack of water! I always think they should put a water stop right where you exit the ramps … Maybe I just psych myself out? But this year, I drank water and Gatorade, the breeze was quite refreshing, and I ended up feeling better than usual. So that was good. Or maybe it was the Elvis impersonator at the end of the ramp, singing along, karaoke style, with Elvis classics from his gold lamé-draped DJ booth. We headed up 2nd Avenue, happily grabbing water on the way, before turning left and going down the steep hill at Seneca to get on the top of the viaduct. 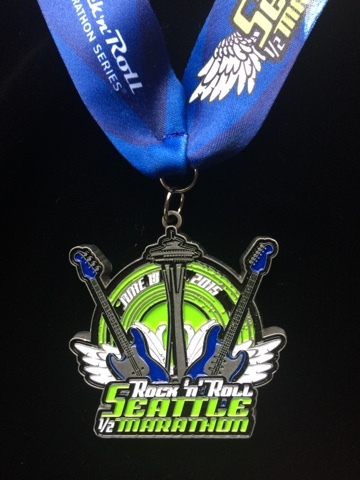 This is my FAVORITE part of Rock 'n' Roll Seattle -- or any race that gives the opportunity to run on top of it. I love that it comes at the end of the race -- it makes me so happy to run up there in the sunshine with the gorgeous view of the water. Another huge energy boost in the final mile or so! We did see someone who had stumbled, fallen, and hit his head. He was sitting in the middle of the road, surrounded by helpers and medics, looking a little dazed, blood trickling down his forehead. Then into the 99 tunnel -- woozy again -- but we kept moving. As we emerged, someone said "three quick turns and you're on Mercer!" Down into the underpass, up the final hill (which always seems Very, Very Long because you can't really see the finish), and then we grabbed each other's hands and sprinted across the finish line in 2:27:29. One very odd thing -- not being stopped by John for a post-race interview! We worked our way through the finish gauntlet … medal, Gatorade, chocolate milk (HOW GOOD IS CHOCOLATE MILK?!?! ), some snacks … and popped out by the fountain. 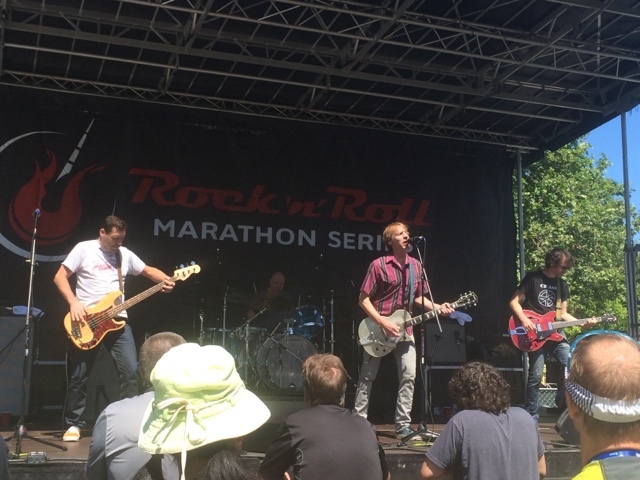 It was just after 10, so we decided to go up to the Mecca to meet up with Kornfield and the Han… drifting back to the Center to watch Mudhoney at 11… and then over to McHugh's for a post-race pint around 11:30. While sitting there I glanced at my phone and discovered that Charley had been sending texts … oops! Sorry we missed the chance to celebrate with the fam! 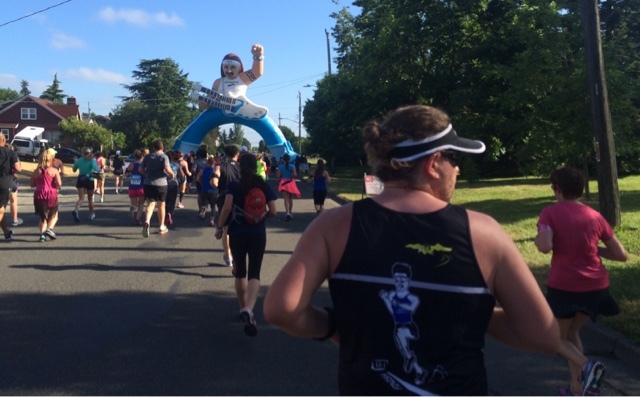 Overall, a fun race… and of course we already signed up for 2016. 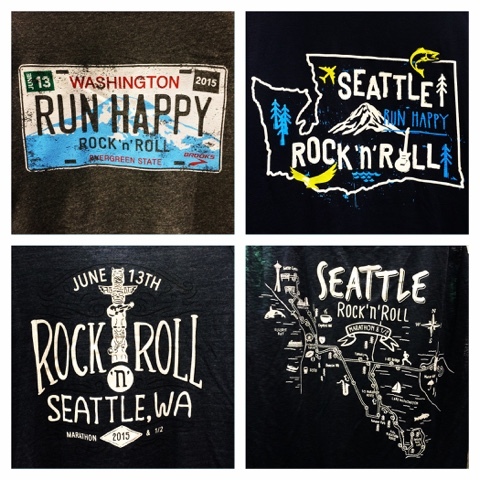 (You can currently register in the presale for Rock 'n' Roll Seattle 2016 for a mere $50+fees for the half, or $55+fees for the full -- a screaming deal! -- through midnight on Sunday, June 21.) Oddly enough, we didn't bump into any runners we knew on the course, at the finish, or after the race. We almost always randomly see old friends out there :). - the viaduct, of course! 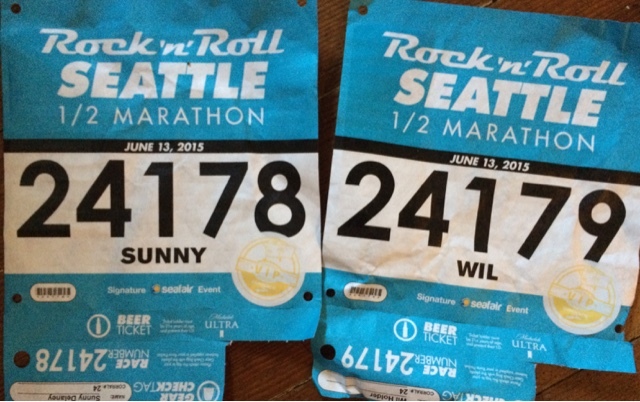 But, seriously, Rock 'n' Roll Seattle is a great race -- one of my favorites. 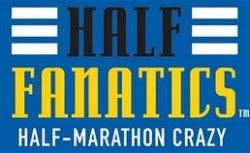 And I plan to keep running it every year, as long as I can.